Calm in the Alfred’s dining room (just before we took it over for our Blue Fox dinner!). Photo: Blair Heagerty Photography. 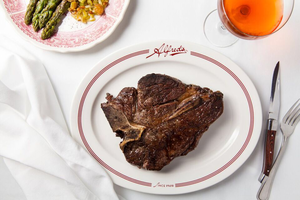 There’s a reason Alfred’s is beloved for their steaks—they do it right (and have been doing so for almost 90 years!). Photo by Alanna Hale. The menu also got a bit of a revamp. I’m so happy to see chef Daniel Patterson has put a modern interpretation of a classic SF dish on the menu, Celery Victor, plus some other additions to the bar bites menu, like mushrooms stuffed with oxtail, marrow, and smoky crumbs, and you can now get their onion rings and fried shishito peppers to share as well. An addition that harks back to Alfred’s Italian roots is the debut of housemade pasta on the menu. There are now three kinds: clam linguine with Manila clams, hand-cut noodles, garlic, parsley; gnocchetti with summer vegetables and green olive oil; and strozzapreti with spicy tomato-vodka sauce. 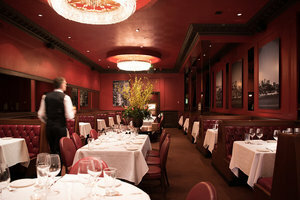 And for those who don’t want to partake in Alfred’s glorious mesquite-grilled, dry-aged Flannery Beef steaks, you’ll find some new options, like lamb chops and petrale sole, on the menu. It’s summertime, so grilled peach melba with raspberry sorbet has made its way onto the dessert menu. See you there. I have one of their burgers (available in the bar only) on my mind, and there are some new seasonal cocktails to try too. New dinner hours: Mon-Thu 5:30pm-9pm, Fri-Sat 5:30pm-10pm; happy hour Mon-Fri 4pm-6pm; Thu lunch 11:30am-2:30pm. 659 Merchant St. at Kearny, 415-781-7058.